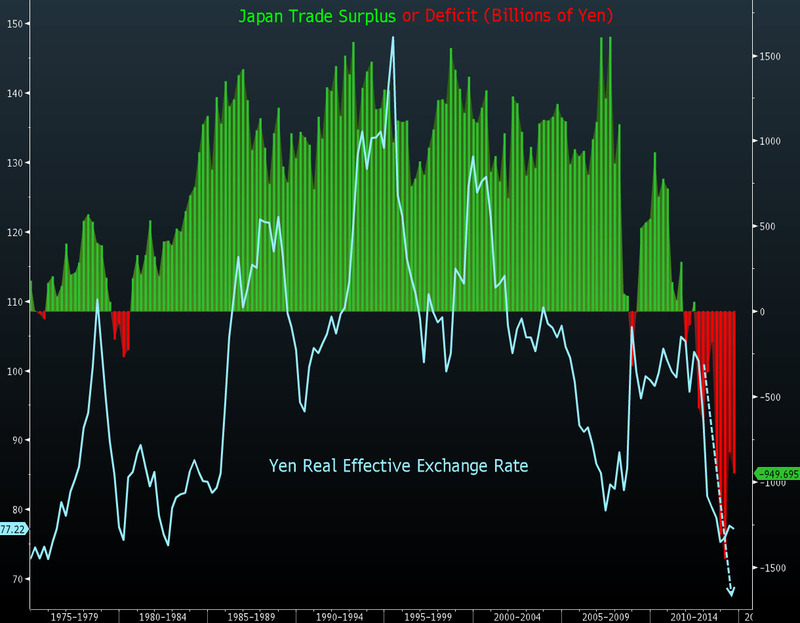 The Japanese Yen’s real effective exchange rate (REER) has collapsed to the weakest since 1982, according to Mitsubishi UFJ Morgan Stanley Securities. Simply put, REER is a trade-weighted measure of Yen strength (or weakness) against, in this case, 59 trading partners; and as the nation posts an unprecedented 27th straight month of trade deficits [43rd straight month of Seasonally-adjusted trade deficits], Bloomberg reports MUFJ indicates “a structural shift” has taken place. The weighted average of a country’s currency relative to an index or basket of other major currencies adjusted for the effects of inflation. The weights are determined by comparing the relative trade balances, in terms of one country’s currency, with each other country within the index. This exchange rate is used to determine an individual country’s currency value relative to the other major currencies in the index, as adjusted for the effects of inflation. This is also the value that an individual consumer will pay for an imported good at the consumer level. This price will include any tariffs and transactions costs associated with importing the good. In the case of an average Japanese person who likes Big Macs, they will pay 71% more (in JPY) for the McDonalds’ haute cuisine if they come to America than they would at home. A couple of profound changes have come to the Japanese markets over the past 3-4 years which has taken a nation with high savings rate, and a very stable economic system into hyper inflation. Until Fukushima, Japan used to loan the US large amounts of money at a low rate of interest. Once the nuclear disaster happened that vanished. But, that did not augment Japan’s deflation miseries……the deflation went on for years, now, they have hyper inflation, and the real reasons are not listed? 1. Japan dumped the dollar for Putin’s basket of currencies over two years ago after another fool round of US sanctions on one of their rich trading partners…..Iran. Regardless of US propaganda, Iran is a rich country today, thanks to the Iraq war, and most nations around the world trade with them. Obama gave Japan a “pass” for dumping the dollar for Putin’s system, whatever that means…….The basket of currencies allow member nations to trade with each other using their own currencies, leaving the dollar out. An electronic currency, very similar to the Sucre, translates the value of each currency at the time of transaction. There is no room for any humbug games, such as completing all transactions in dollars……..who knows what games the US played with their allies? Even harder for Japan has been the true reason for their fall in exports……the high radioactivity of the products cause many nations to return Japanese goods as too radioactive to be safely used in their countries. This is why Japan is losing ground quickly in their only market of profit…..exports. Why the author does not make this clear is beyond me. Japan is quickly become a dead nation. Unfortunately, it has already killed a very rich and productive ocean……the Pacific. Their radioactive reactors should have been buried in cement as Russia did in the early 1980s when they had one blow up. But, oh no, lets lie to the world and destroy our food chain for all time. I have no sympathy for them, and the death some are already experiencing is very painful……….they are the object lesson why corporations ought to never run countries.